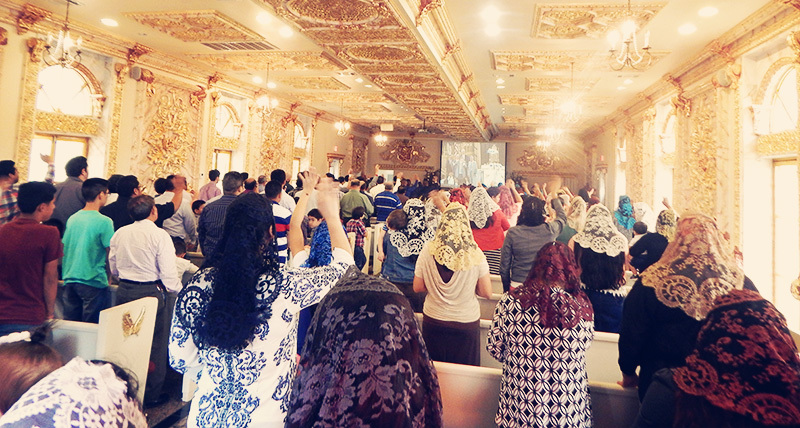 On Sunday, the universal church of The Light of The World had a great blessing to view through the internet, the presentation of the the Apostle of the Lord, Naasón Joaquín Garcia in East Los Angeles, California. We were witness of the great joy and blessing of our brethren, and we also participated in their jubilation as they welcomed the Apostle of the Lord. The Apostle Naasón expressed his joy and happiness to the brethren in East Los Angeles saying to them that he had an ardent desire in his heart to be with them. In the past he had been there so many times as a minister, as a collaborator in the ministry and they welcomed him as such in that time. But now, he was greatly pleased to see how the church received him; not as a minister or as a brother in charge, but now as their Father in faith. Now that God has manifested his holy will to the people of God, he is pleased to say that we are now his children in the faith. For the work of the Lord done in our hearts, the Apostle Naasón gave all honor and glory to our Lord Jesus Christ. The Apostle of the Lord gave testimony of the 1st Youth Assembly for Candidates to the Work of the Lord in his era. This event was held in various locations. This event highly surpassed his level of expectation. About 5,500 young brothers and sisters assembled in Silao, Guanajuato, Mexico on May 10 of this year. The Apostle of the Lord also observed the youth of the church in various locations that particpated in this event such as in Houston, Texas; in New York, in Pasadena, California; in Honduras, in El Salvador, in Columbia, in Panama, in Chile. Also young brothers and sisters in Spain and France. The Servant of God’s message that he imparted to his us came with a purpose. His purpose is to make the Ministers, the parents, the members and also all the youth of the church responsible to motivate our children and youth to serve in the work of our Lord. All of us must be involved in the teaching of our children and youth in the things of God. We must all be involved to teach them in the knowledge of God. Ministers, parents and the whole church must take on this task. We teach our children and youth about the material things in life, but we must not forget to teach them about the spiritual aspects in the church of the Lord. We must teach them the spiritual principles and values and instill in our children the things of God. Even our most youngest children we must teach them in the things of God. Even though they don’t have a fully developed understanding because of their tender age, we can still teach them right from wrong. We can instill in them the spiritual teachings of God. They are like sponges. They absorb everything that is in their learning environment. The Servant of God asked: “In the spiritual aspect, what have you done for your son and for your daughter?” How do they learn? By giving them advice and teaching them. The Servant of God invited all the ministers of the church to ask fundamental questions to all the young children and youth in their respective churches. Basic fundamental questions such as: Why do the sisters use a veil or covering over their head when they come to the house of prayer? Why must we come to church every day? The minister asking these questions must ensure that they respond with a biblical text explaining the reason why we do these things in the church. The reason why the Servant of God wanted the Ministers to perform this test, is to see how much time we have committed to our children in teaching them the fundamentals of the doctrine. Their could be in our children and youth just a tradition or a custom being in the church of the Lord. The Apostle of God does not want our children to be here by custom or by tradition. Tradition is a sin. They should be here by faith and conviction. Serving God by faith and conviction. They should know what they believe in. The best way to give our children the best education in the material aspect is by taking them to school every single day. Every single day they are being saturated with lessons and they learn to be a success in life. We as good, loving parents should ensure they get the best education out there. This is also true in the things of God. We must also ensure our children and youth get the best spiritual education in the doctrine of our Lord. There is no other place better than in the church of God. This is the commitment the Servant of God wants from his ministers, parents, and members of the church: Teach our children on a daily basis. May our children and youth have the faith of God in them so that they may experience in their hearts a sense of joy and happiness being in the church of God. Deuteronomy 17:18-20 18) And when he has taken his place on the seat of his kingdom, he is to make in a book a copy of his law, from that which the priests, the Levites, have in their care: 19) And it is to be with him for his reading all the days of his life, so that he may be trained in the fear of the Lord his God to keep and do all the words of this teachhing and these laws: 20) So that his heart may not be lifted up over his countrymen, and he may not be turned away from the orders, to one side or the other: but that his life and the lives of his children may be long in his kingdom in Israel. This was the law God established for the king who was to sit over the people of God. The daily reading of this book, the copy of his law; would instill the fear of the Lord in his heart. The king would have to read God’s law daily and not only read it, but as he read it constantly, it would serve as a daily reminder to keep and do all of God’s teachings and God’s laws. This practice would also instill humbleness in his heart to obey and not turn away from the commandment of God. The Apostle of the Lord expressed if this was the law for the king, it would also be for people of his kindgom. Fulfilling the will of God in our children and youth, God’s blessing shall be upon our household. It is very important and necessary that the people of God read the scriptures on a daily basis. It will bring God’s blessings to all of us. The Apostle of the Lord has established that we read the scriptures every day for one hour with our children. This will help our youth and children be prepared and be well capacitated, educating them in the things of God and in the Lord’s doctrine. May our children and youth be a generation filled with the faith and knowledge of God.